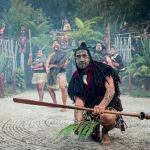 Experience New Zealand's North and South Island on the 18 day Best of New Zealand coach tour, AAT Kings' most extensive tour covering the whole country. 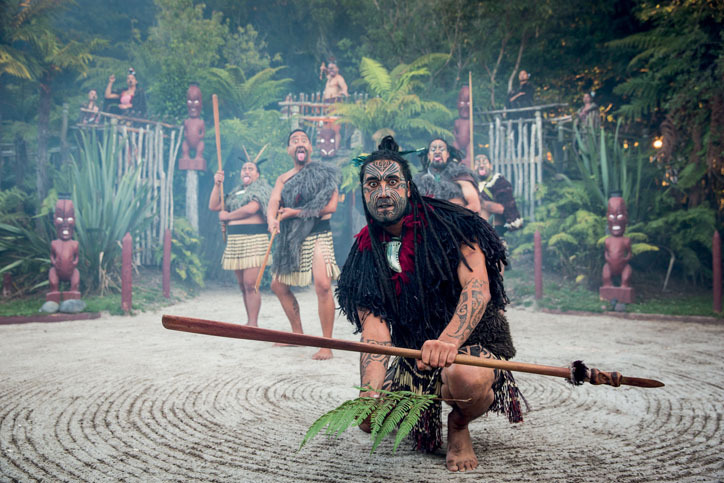 Highlights include dining at the top of the tallest structure in the Southern Hemisphere – Auckland's Sky Tower, a unique Māori culture experience with the Realm of Tāne in Rotorua, cruising on the Milford Sound, and time to discover Franz Josef Glacier in all its glory. On arrival at Auckland Airport you’ll be met and transferred by private car to your hotel. The afternoon is at leisure for you to explore Auckland. You could visit the Sky Tower for amazing views of the city, Viaduct Harbour and surrounding volcanic hills. Perhaps visit the Auckland Museum or go shopping in stylish Parnell. This evening meet your Tour Director for a welcome reception. Travel through Orewa and the scenic Hibiscus Coast. Take a walk among the kauri trees at Parry Kauri Park. Explore Whangarei, the northernmost city in New Zealand, and then it’s off to the beautiful Bay of Islands. 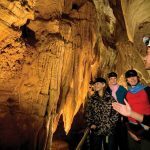 Experience natural wonders and spectacular scenery as you cruise to Cape Brett and through the Hole in the Rock. This evening enjoy dinner with wine at your hotel. This morning you have free time to relax in the Bay of Islands and this afternoon you’ll return to Auckland. Tonight’s highlight dinner with wine is at Eight Restaurant, located at The Cordis. Eight offers the freshest, quality ingredients, including mouthwatering seafood and desserts. A city sights tour will start your morning in Auckland. Travel around the waterfront to Mission Bay, with a stop at Bastion Point and the Michael Joseph Savage Memorial for stunning photos of Auckland and surrounds. 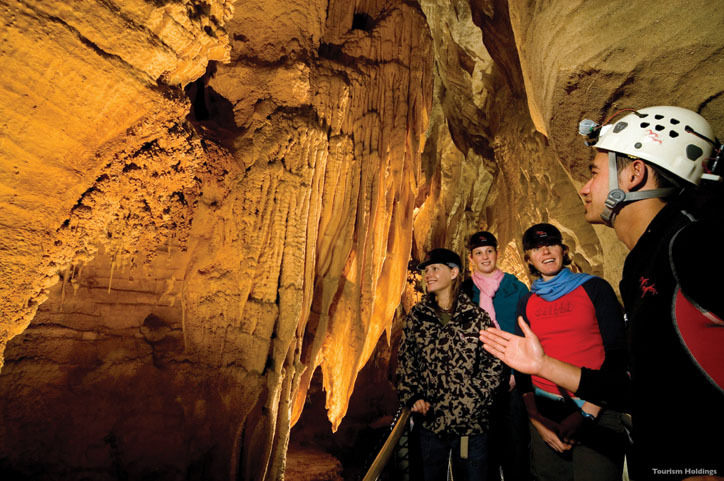 Follow the meandering trail of the Waikato River to Waitomo Caves. 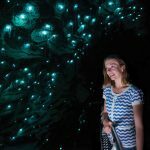 Tour the amazing limestone caverns and sail through the still waters of the sparkling Glowworm Grotto. 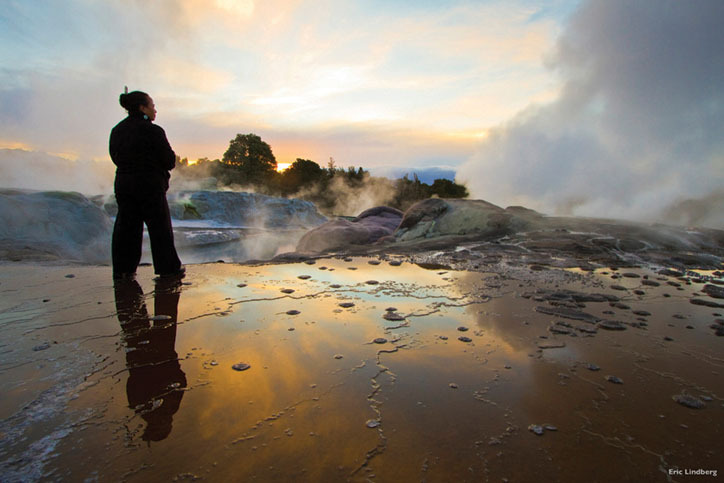 Then cross the rolling hills of King Country to Rotorua, where your orientation tour takes in spectacular views of Lake Rotorua. 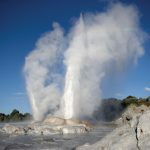 Say ‘haere ra!’ (goodbye) to Rotorua this morning and journey out through pine forests and farmland to a little hidden spot – Huka Falls. From here the road unfolds in a broad panorama of Lake Taupō, New Zealand’s largest lake. 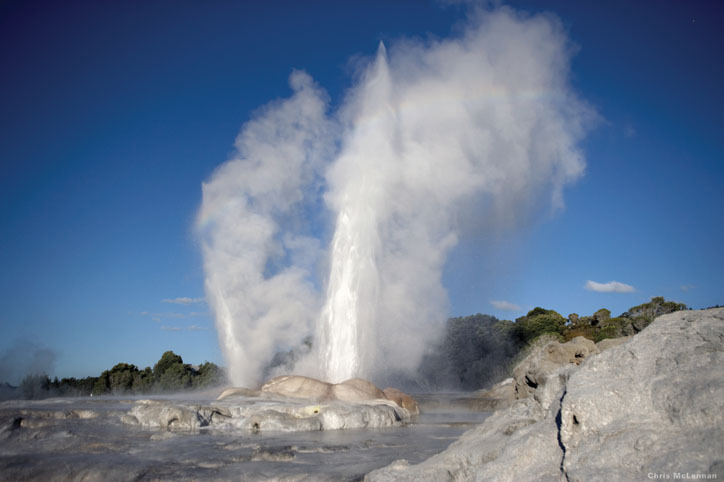 You’ll then journey south over the Central Plateau, New Zealand’s main volcanic area. 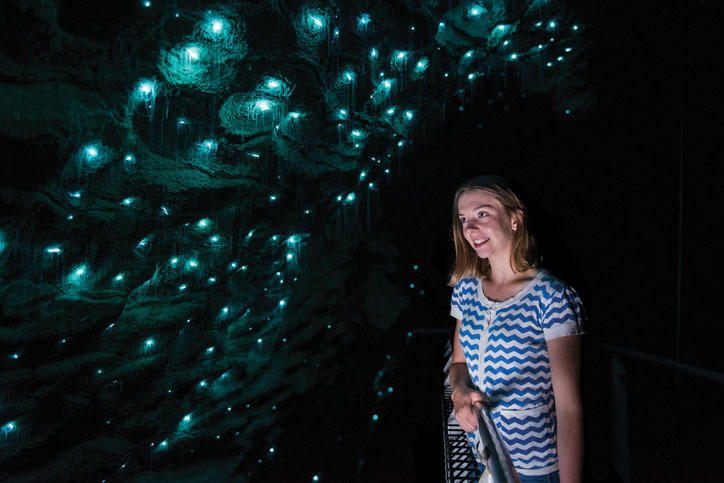 Travel along the Kapiti Coast to Wellington, New Zealand’s capital city, and enjoy an exclusive after-hours guided tour of Te Papa. Before leaving there, top off the night with a highlight dinner. Why not discover more of Wellington this morning. There’s time to visit the Parliament buildings and the Beehive, home to New Zealand’s government. Later you’ll visit Te Papa and explore the fascinating exhibits at your leisure. Cruise the Cook Strait into tranquil Queen Charlotte Sound. The village of Picton is next, then it’s on to Blenheim for a sightseeing tour. Tonight, enjoy a highlight dinner prepared from local produce and matched with fine Marlborough wines. This morning stop to meet some New Zealand fur seals at Ōhau Point, and watch as they frolic and play in the tidal currents. Take a helicopter flight out of Kaikōura (own expense) for whale and dolphin viewing, or stop in at one of many local eateries and sample a Kaikōura seafood delight – crayfish. This afternoon’s journey follows the Pacific Ocean coastline where roaring sea meets enormous bush-clad mountains. Travel across the northern Canterbury Plains and into Christchurch. Tonight, speak with your Travel Director about dining recommendations in Christchurch’s inner city. Visit Morelea Farm, a typical working sheep farm, where you’ll get a taste of traditional New Zealand country life. You will be welcomed into the home of Angie and Stan Taylor and their 240 hectare garden, and have the chance to experience sheep shearing and farming demonstrations before enjoying a BBQ lunch. Just wait until you try Angie’s famous pavlova dessert! Listen to the family’s story of growing up in rural New Zealand and their challenges of farming in the foothills of the Southern Alps. Later see Lake Tekapo and Lake Pukaki and visit the Church of the Good Shepherd on your way to Twizel. 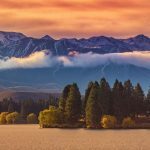 View the Waitaki hydro scheme and Benmore Dam. Travel through Ōamaru, with its limestone buildings, to Dunedin. Choose one from a range of Included Choice sightseeing experiences. Tour stately Larnach Castle, ride the historic Taieri Gorge Railway, take a wildlife cruise or an interactive tour of Speight’s Brewery. This evening enjoy dinner with wine at your hotel. 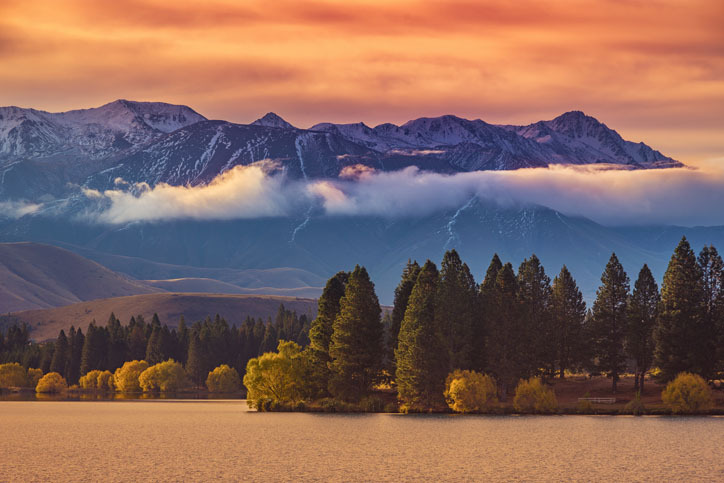 Today, travel across farming land to the village of Te Anau on the shores of Lake Te Anau, the South Island’s largest lake. This evening enjoy dinner with wine at your hotel. You’ll be awestruck by the magnificence of the World Heritage-listed Fiordland National Park. Amazing photo opportunities await you today as you see rainforest, ancient glaciers, mountain ranges, and the handmade Homer Tunnel. Pass the Mirror Lakes, Pop’s Lookout, Cleddau Valley and The Chasm. Your cruise on Milford Sound will take you past Bowen Falls and Mitre Peak. Afterwards, travel along the shores of Lake Wakatipu on your way to Queenstown, where an orientation tour finishes this highlight day. Visit the historic gold mining village of Arrowtown on the Arrow River, previously one of the world’s richest rivers. Enjoy the tastes of delicious stone fruit at Cromwell, the stone fruit capital. See a trio of lakes – Dunstan, Hawea and Wanaka. 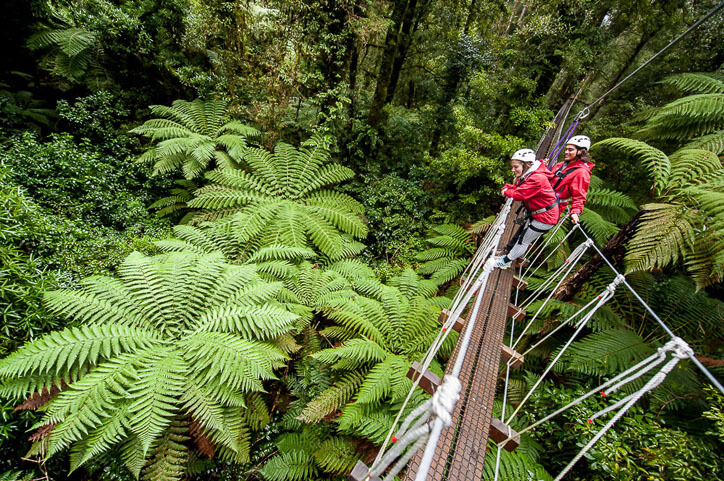 Travel over the Haast Pass, view amazing Thunder Creek Falls, and take a small rainforest walk. 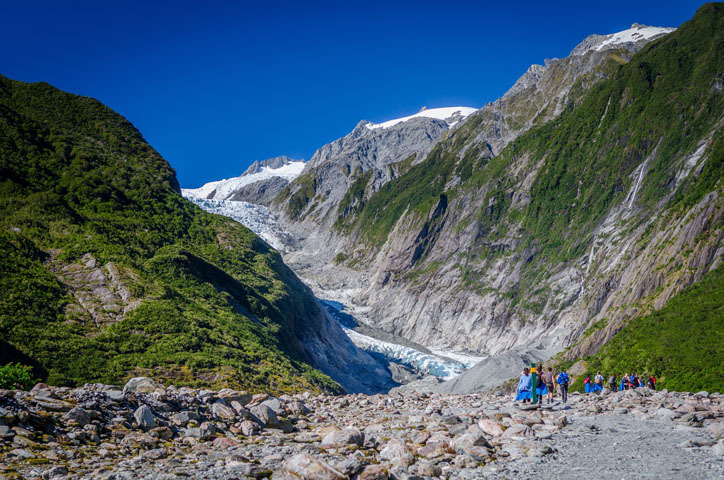 Then it’s on to Franz Josef Glacier, the world’s most accessible glacier. 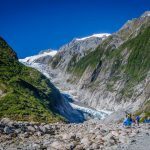 There is time this morning to explore Franz Josef Glacier. You can see it from the air on an optional flight (weather permitting) or take a glacier hike! (Both optional.) 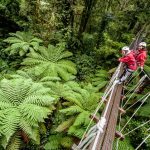 It’s time for an exhilarating adventure among temperate rainforest giants on the West Coast Treetop Walk. Then depart for Hokitika, home of pounamu (jade), for a studio visit and jewellery demonstration. Later, travel to Punakaiki to view the Pancake Rocks and Blowholes. You will stay in an eco-resort right on the waterfront. 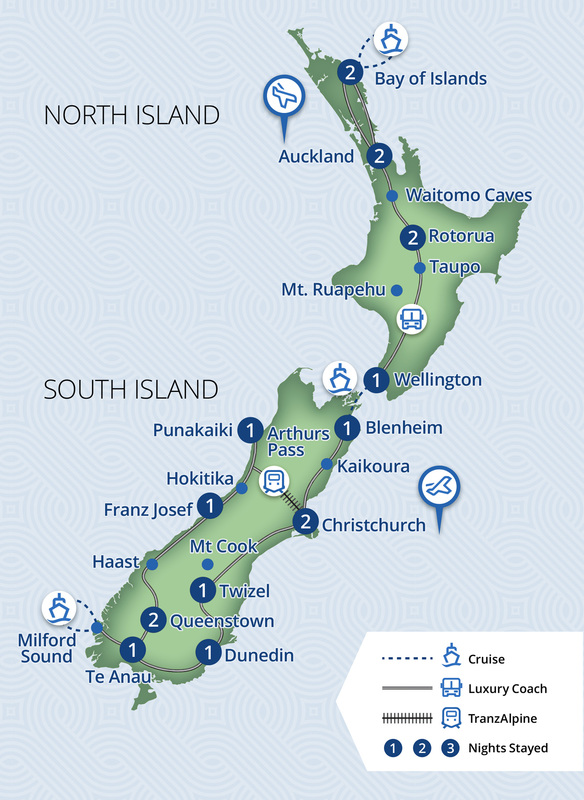 Travel to the alpine village of Arthur’s Pass and board the TranzAlpine. This spectacular train journey dates back to 1914, and is rated as one of the word’s most scenic train trips. The train forges through tunnels and over viaducts with panoramic views of snow-capped peaks, icy rivers, beech forests, gorges and river valleys. Join your Tour Director this evening for a farewell dinner with wine. There are 21 reviews of this tour from past clients of Relaxing Journeys, averaging 4.7 out of 5. Trip leader, Tania and driver, Rob were superb...we can't come up with enough superlatives to describe this tour...perfect weather, awe inspiring scenery, flowers in full bloom, kind and friendly Kiwi people....excellent hotels, meals, service....included choices and options were great...we loved Bay of Islands and South Island....Milford Sound and flight out were spectacular. What a great holiday - we enjoyed every day and thought the tour was great value. 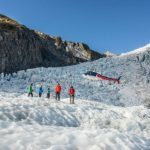 We had more inclusions than we expected and were blown away by the outstanding beauty of the South Island, in particular the Franz Josef helicopter trip. Have recommended the tour to our friends. What an excellent tour. Following a slight glitch on arrival at Auckland Airport where we were supposed to be met and taken to our hotel by private car, but after some help from another operator found that we were booked on an airport shuttle to which we were subsequently directed to their pickup point, and from there, all ran smoothly. The accommodation and meals were great, the pace of the tour was excellent, and the sights stunning compared to what we are used to at home in Australia. Little touches like the 2 drink vouchers with the provided evening meal was much appreciated. Tour inclusions were also very extensive. The fact that the tour coach was not full also allowed us to get to know fellow travellers better. The online booking process with Relaxing Journeys was smooth and straight forward and we thank Marie for her professionalism, information and consideration. The tour was really great, and a great pace, with so many interesting things to do and places to see - highly recommended. 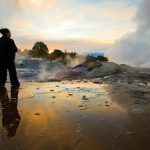 We really enjoyed our time on the North Island and would love to have spent more time there. South island very beautiful but we found the coach a little too crowded with 49 passengers on board. Coach driver and tour guide were both terrific could not be faulted. Having stated that, it certainly has not put us off seeing more of NZ sometime in the future. Next time we will do a drive yourself and we will contact you to help us once again. Generally very good and happy to recommend to future travelers. A couple of negatives however. Firstly the tour director did not seem to be able to explain the included choices very clearly confusing them with optional choices. While we understood what was on offer a lot of the other passengers did not and there was often confusion especially as the tour director kept pushing specific options which made people think they were included etc. Great concept but poorly understood and poorly applied by tour director. Also there were inconsistencies between the itinerary and actuality - e.g. the Dunedin itinerary implied included choices would happen in the morning but they had to be in the afternoon. Most notably the itinerary indicated a visit to the treaty house in the Bay of Islands but on the morning we just drove past with a glib comment about some political bias by the guides. This wouldn't have been so bad if we had been told because we had the previous day free and we were staying within walking distance - so we could have visited independently but we assumed it would be part of the tour. However I repeat that despite those disappointments the tour was great and the tour director and bus driver (these people deserve greater recognition) went out of their way to help. An excellent tour with a great itinerary with some minor flaws. Although almost everything was great, there were several disappointments. A couple of the hotels were very poor and some of the food was not very good (there was a general consensus in our group of 'no more buffets')! Other than that things were terrific and we had a wonderful time. There was a nice mix of organized activities and 'free time' with plenty of optional activities for those interested. The tour director Alan was particularly good and extremely helpful to everyone. Despite going during winter we had great weather and really enjoyed the snow in the South Island. A great tour though could have done with an extra day at Bay of Islands. Super guide and driver - will certainly recommend it to others. Everything went very well. The tour guide and the driver were friendly, knowledgeable, helpful and fun to be with. We only had 25 passengers on our coach and were down to 19 around day 10. Coach was very comfortable, both the seating, air conditioning and visibility. All of the stops were well timed and we never felt rushed to see a sight nor were we waiting around killing time. The accomodations were all very nice with the exception of the Travelodge in Wellington which I would rate as fine. The only 'issue' that we had with hotels were that only a few were air conditioned however we were able to request fans in most spots. We were VERY happy with the pace of the trips and the variety of sights to see and things to do. 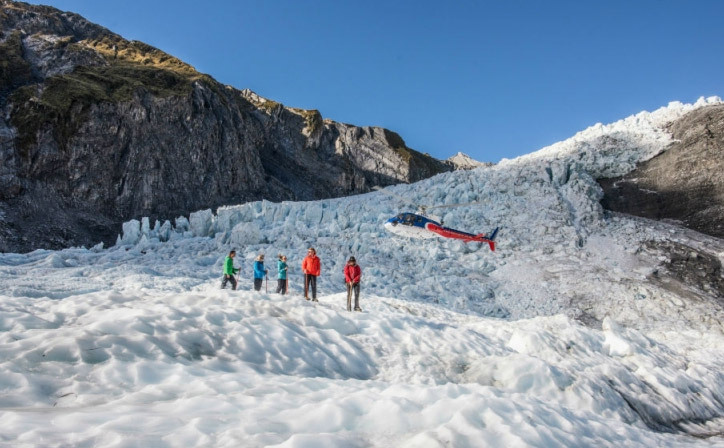 Our biggest splurge was the Helicopter tour to the Glacier, and the light plane trip to the tip of the North Island. I would consider both to be a once in a life time experience. I would recommend this trip to anyone who wants to see the sights in a relaxed manner. No stress from driving, looking at maps etc. Wonderful.